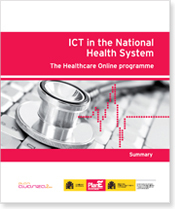 The initiative forms part of the monitoring process of the Avanza Plan´s "Healthcare Online Programme", in wich the Ministry of Health and Consume Affairs (Ministerio de Sanidad y Consumo, MSC) and the Autonomous Regions collaborate alongside the Ministry of Industry Tourism and Commerce (Ministerio de Industria Turismo y Comercio, MITYC), acting through red.es. It´s purpose is to make the information gathered during the Avanza Plan´s Healthcare Online Programme available to all agents involved. Aditionally, data has also been collected that reflects the initiatives carried out over the last decade by the regional Departments of Health and the Healthcare Services in the Autonomous Regions and the boost these have given to the Healthcare Online Programme.